GlobalTT offer a low cost VSAT, satellite internet access service to customers in Africa. 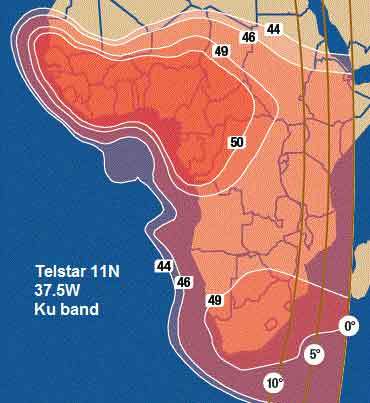 The Democratic Republic of Congo (DRC) is favourably covered by a particularly powerful Ku band beam from the Telstar 11N satellite. See the satellite beam coverage map below. The VSAT technology used is SkyNet-IP. The large dish teleport hub is a privately owned facility in Europe, with a high speed terrestrial optic fibre back-bone internet connection. West, central and southern Africa coverage Telstar 11N at 37.5 West. Operation to the west of the 10 deg beam elevation contour is recommended. This review page is based on an email newsletter sent out by GT&T sa, dated 26 Dec 2010. Please email me eric@satsig.net to edit or delete.